Problem recognition - Recognizing the need for a service or product. Whether they’re purchasing a breakfast cereal or a sports car, all consumers go through basic steps, known as the consumer decision-making process, to determine what products and services will best fit their needs. If you work in sales or marketing, review these steps and put yourself in the customer’s shoes to make more of an impact. 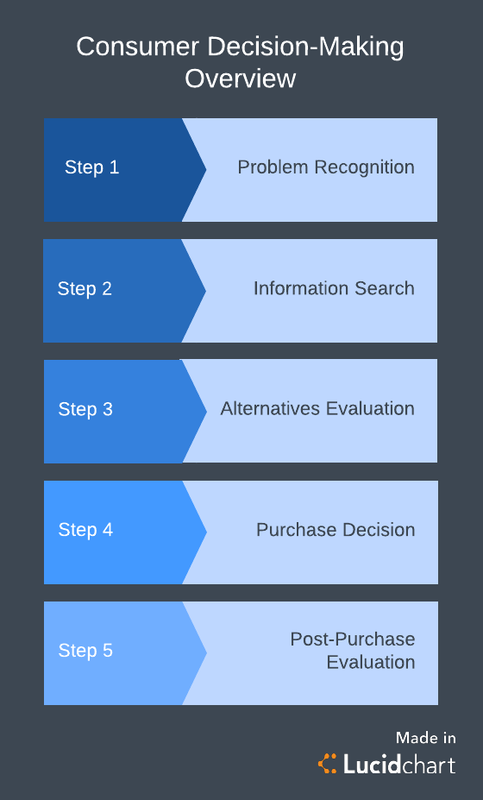 Generally speaking, the consumer decision-making process involves five basic steps: Start to understand the unique decision process of your customers with this decision flowchart template from Lucidchart. The first step of the consumer decision-making process is recognizing the need for a service or product. Recognition is driven by both internal and external stimuli. An internal stimulus occurs within you—it could include basic impulses like hunger or a change in lifestyle. An external stimulus originates from an outside source, like a billboard or review from a friend. Need recognition, whether it occurs through internal or external means, prompts the same response: a want. Once a consumer recognizes a want, they need to gather information to understand how they can fulfill that want. Example: Winter is coming. This particular customer has several light jackets, but she’ll need a heavy-duty winter coat if she’s going to survive the snow and lower temperatures. Your consumer has recognized a want. Now comes the task of gathering information. Consumers again rely on internal and external factors, as well as past interactions with a product or brand, both positive and negative, to make their decision. In the information stage, the consumer may browse through options at a physical location or consult online resources, such as Google or customer reviews. Your job as a brand is to give the potential customer access to the information they want, with the hopes that they decide to purchase your product or service. When creating content, put yourself in the shoes of your customer. What might they be interested in knowing about your product? Is there something that sets your product apart from competitors? Explore ways to present information to your potential customers that will help them arrive at a decision faster and easier. Example: The customer searches “women’s winter coats” on Google to see what options are out there. When she sees someone with a cute coat, she asks them where they bought it and what they think of that brand. At this point in the consumer decision-making process, the prospective buyer has developed criteria for what they want in a product. Now they weigh their prospective choices against comparable alternatives. Alternatives may present themselves in the form of lower prices, additional product benefits, product availability, or something as personal as color or style options. Your marketing material should be geared towards convincing consumers that your product is superior to other alternatives. Example: The customer compares a few brands that she likes. She knows that she wants a brightly colored coat that will complement the rest of her wardrobe, and though she would rather spend less money, she also wants to find a coat made from sustainable materials. 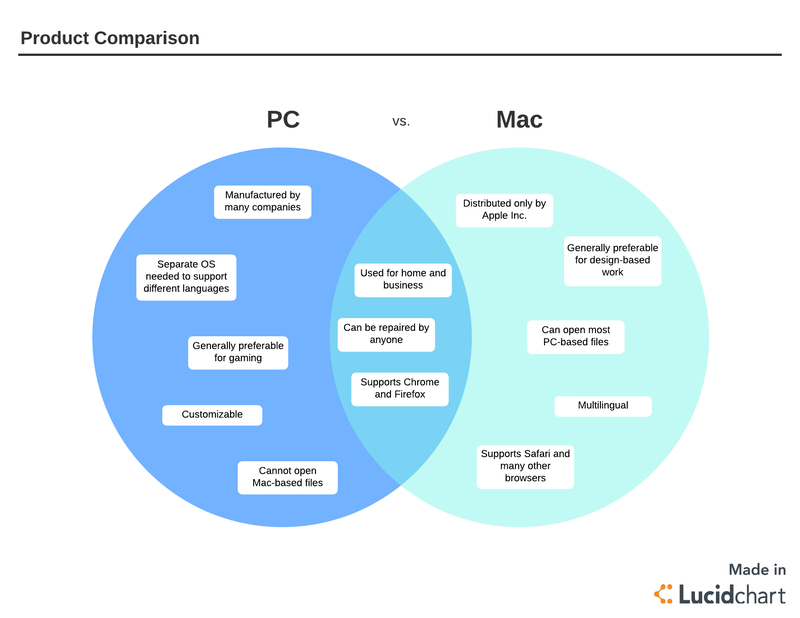 Use a Venn diagram in Lucidchart to work through the perspective of the customer and compare and contrast your product with a competitor’s product. This is the moment the consumer has been waiting for: the actual purchase. Once they have gathered all the facts, including feedback from previous customers, the consumer should arrive at a logical conclusion on the product or service to purchase. Throughout this process, external and internal factors impact the end decision. Even ever-changing factors like emotions or the weather can affect when and how a purchase is made. If you’ve done your job correctly, the consumer will recognize that your product is the best option and decide to purchase. Example: The customer finds a pink winter coat that’s on sale for 20% off. After confirming that the brand uses sustainable materials and asking friends for their feedback, she orders the coat online. Did the purchase meet the need the consumer identified? Is the buyer happy with their purchase? Remember, it’s your job to ensure your customer continues to have a positive experience with your product. Post-purchase engagement could include follow-up emails, discount coupons, and newsletters to entice the customer to make an additional purchase. You want to gain life-long customers, and in an age where anyone can leave an online review, it’s more important than ever to keep customers happy. Understanding the consumer decision-making process can help brands target their marketing. Everyone engages in some type of decision-making process, and successful brands should do everything they can to influence the consumer throughout their decision-making process. Putting yourself in the customer’s shoes can help you steer the customer towards your product. Refine your marketing material to capture consumer interest sooner and ensure your product makes it into consideration. 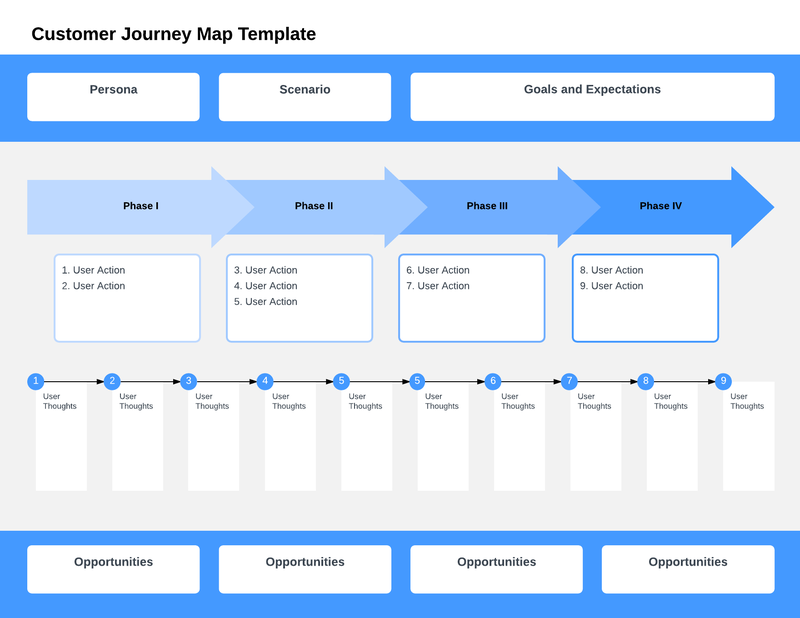 Use a customer journey map from Lucidchart to better understand your consumer’s decision-making process. And don’t be afraid to experiment with different types of collateral throughout the different stages of the decision-making process.